We are spoiled here in the Southwest and situated on the edge of Exmoor, The Ginger Peanut is the perfect location to base yourself and explore Devon. Our aim is to furnish you with information on activities and gorgeous places to visit whilst staying in one of our beautiful bedrooms and making the most of Peter Mundy’s fabulous restaurant. A short drive from Bampton takes you to Wimbleball Lake nestled in the hills of the Exmoor National Park. 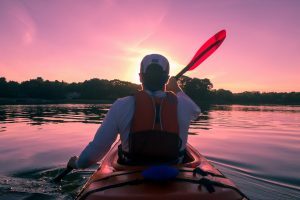 This gorgeous location offers a myriad of activities, including kayaking, sailing, standup paddleboarding, fishing, raft building and windsurfing. Or, if you are more of a landlubber, archery, climbing and high ropes provide activity and adventure. Nature paths take you around the lake on foot, off-road cycle trails for all abilities provide an opportunity to explore if you are a keen cyclist. Alternatively, take a gentle amble around one of the many paths and enjoy tea at the cafe. 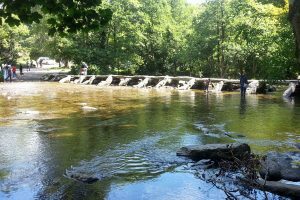 The Clapper Bridge at Tarr Steps is set in the beautiful wooded valley of the River Barle. Perfect for a short stroll or a slightly longer walk if feeling energetic, the path takes you along the river making the most of the local wildlife and glorious vistas. Walk up to the heathland on Winsford Hill and you will probably be rewarded with sightings of Exmoor ponies and maybe even a stag or two! Tarr Farm Inn provides a welcome break after your walk for tea, lunch or dinner. Just over the county boundary but not far from The Ginger Peanut, lies the medieval village of Dunster within the Exmoor National Park. With its Castle, Yarn Market, Priory, Tithe Barn, listed buildings and working watermill milling its own flour, Dunster has to be well worth a visit. The Castle towers over the village and was home to the Luttrell family for 600 years. It is now owned by The National Trust with the castle and gardens open to the public. 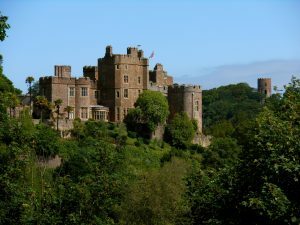 Dunster is accessible by coach, car and even steam train along the heritage railway to Dunster Station. And finally to round off your day exploring Exmoor, back to The Ginger Peanut for a fabulous dinner in the Restaurant and your ever so comfy bedroom!